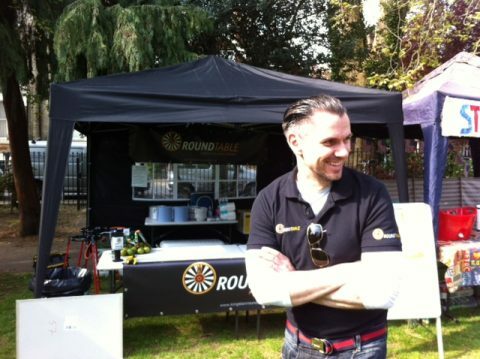 Saturday 7th May 2016 saw the Kingston Round Table running a chilli stall at the Surbiton Food Festival. This was our inaugural attempt at the Festival and was intended as a test case: could this be a third major, regular charity fund raiser of the year? Nick, parent Sandy, Robert, Darren, Sean, Martin, Edd, James, Richard and Andy all worked on the stall during the day, cooking, serving and selling. It must have been good as we pretty much sold out. Thanks to Sandy for the recipe, and thanks to Nick for the taste testing of the different recipe versions! A special note of thanks goes to Sean who provided a lot of the hardware needed on the day - without that it would not have been possible. The KRT team at the stall enjoyed the day, learned a lot about selling food from a stall to customers, and may even have turned a profit. We'll be back in 2017 with an enhanced approach with the aim of rising more money for charity. All profits from the day will go to Kingston Food Bank. Watch this space for an update on how was raised. Always a massive fan of linking to bloggers that I love but do not get a lot of link like from. The time to read or visit the material or web sites we have linked to beneath.